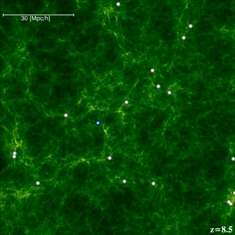 (PhysOrg.com) -- The images, produced by scientists at Durham University's Institute for Computational Cosmology, show the "Cosmic Dawn" - the formation of the first big galaxies in the Universe. The Cosmic Dawn began as galaxies began to form out of the debris of massive stars which died explosively shortly after the beginning of the Universe. The Durham calculation predicts where these galaxies appear and how they evolve to the present day, over 13 billion years later. The researchers hope their findings, which highlight star forming galaxies, will improve their understanding of dark matter - a mysterious substance believed to make up 80 per cent of the mass in the Universe. Gravity produced by dark matter is an essential ingredient in galaxy formation and by studying its effects the scientists eventually hope to learn more about what the substance is. The research is published in the Monthly Notices of the Royal Astronomical Society and was funded by the Science and Technology Facilities Council (STFC) and the European Commission. The work combined a massive simulation showing how structures grow in dark matter with a model showing how normal matter, such as gas, behaves to predict how galaxies grow. Gas feels the pull of gravity from dark matter and is heated up before cooling by releasing radiation and turning into stars. The simulation images show which galaxies are forming stars most vigorously at a given time. Although the galaxies are biggest at the present day, the rate at which they are making new stars has dropped greatly compared with the rate in the early Universe. The calculations of the Durham team, supported by scientists at the Universidad Catolica in Santiago, Chile, can be tested against new observations reaching back to early stages in the history of the Universe almost one billion years after the Big Bang. Lead author, Alvaro Orsi, a research postgraduate in Durham University's Institute for Computational Cosmology (ICC), said: "We are effectively looking back in time and by doing so we hope to learn how galaxies like our own were made and to understand more about dark matter. "The presence of dark matter is the key to building galaxies - without dark matter we wouldn't be here today." Co-author Dr Carlton Baugh, a Royal Society Research Fellow, in the ICC, at Durham University, said: "Our research predicts which galaxies are growing through the formation of stars at different times in the history of the Universe and how these relate to the dark matter. "We give the computer what we think is the recipe for galaxy formation and we see what is produced which is then tested against observations of real galaxies." Professor Keith Mason, Chief Executive of the Science and Technology Facilities Council, said: "Computational cosmology plays an important part in our understanding of the Universe. Not only do these simulations allow us to look back in time to the early Universe but they complement the work and observations of our astronomers." Reading such dramatic titles as "Cosmologists 'see' the cosmic dawn" makes me chuckle, like we would chuckle now at the advocates of epicycles back in the 1600s. The childishness of such concepts as "dark matter" is so obvious, yet intelligent people can't give themselves clarity of mind to see the Emperor *really* has no clothes! This entire theory is flawn. Now the invented this "dark matter", "dark energy", etc.... just to justify theirs own ideas. It no more a question of observation... we should start believe in Darth Vader's force black side too. FTA:"The researchers hope their findings, which highlight star forming galaxies, will improve their understanding of dark matter - a mysterious substance believed to make up 80 per cent of the mass in the Universe." Makes up 22%? Pfft its obviously that fat mexican i saw on tv. Stop advertising in your comments! What about a simulation involving heavenly angels instead? Go ahead. Nobody is stopping you. The childishness of such concepts as "dark matter" is so obvious, yet intelligent people can't give themselves clarity of mind to see the Emperor *really* has no clothes! Well, Einstein, what's your alternative explanation? Or are you just big talk? "Cosmologists 'see' the cosmic dawn"
This was another case of interesting science undercut by a poorly thought out article with an even worse headline. There is nothing wrong with the idea of testing theory against observation by running a computer simulation. Which is what was done if you read the end of the article where the smidgen of actual information is. If you read only the start and the headline you get a load of crap. Whoever wrote this article needs an editorial spanking. This sort of pap is why editors exist in real journalism. Sure would be nice if physorg.com could find a way to hire one. The sad thing is that almost every article on this site has the exact same problem. Headline is totally off. No real information until the last paragraph. I don't read all the articles but it seems more like fifty percent to me. Many are adequate, at least considering that this is more like quick news service than a serious magazine. Its that other half that bugs me. Yes some of the actual science looks to be of the publish or perish variety but the dubious headlines bug me. Is this site owned by the Murdock or just someone who learned at his feet? Really, I think its just a lack of adequate editorial supervision. Most likely from a shortage of funds. You're either inferring dark matter is in fact nothing, or you think you know exactly what it is. Either way you aren't convincing me so please tell us your thoughts. The Real Explanation: "Dynamic Electromagnetic forces in Cosmic plasmas"